Now that your e-commerce business is up and running and your products are going out the door, and you’ve read our articles about Shipping and Fulfillment and Drop-Shipping, it’s the time to focus on the last part (but definitely not the least important) of our shipping methods series: reverse logistics. Being able to accept returns and exchanges is key to building a successful e-commerce business, and developing a solid returns policy will help you keep your churn rate low and build a loyal customer base. E-commerce never could have grown into the force it is today if it weren’t for the ability to reliably ship products. E-commerce, as an alternative to brick-and-mortar retail, required a dependable infrastructure in place to make it just as easy for consumers to receive their goods, otherwise shoppers would have always opt for the physical store. For the same reason, it’s just as important to provide your customers with an efficient and straightforward way to return or exchange products. Your returns policy shouldn’t be designed to discourage returns, rather it should be seen as a value-added service for your customers. This approach has allowed Zappos to achieve an unprecedented 75% return customer rate and break 1 billion USD in sales in 2008. Zappos has made returns a core part of their marketing strategy, which is one of the reasons why they are so often praised for having the best customer service in the business. The conventional wisdom suggests that a high return rate is a bad thing, so many traditional businesses make the mistake of trying to discourage refunds and exchanges in any way they can. This often comes in the form of making it difficult for the customer to return a product, such as by not being clear and upfront about the return policy or by forcing customers to contact customer service directly. If you force your customers to hunt for your return policy, you are ensuring that they won’t buy from you again. In fact, surveys have found that most customers want the details of a return policy ahead of the time of purchase, with 72% of German respondents and 48% of American respondents claiming they would give more business to stores that have hassle-free returns. Tell shoppers right from the beginning how easy it is to return a product if it’s damaged or not what they expected, how much time they have to file a return, and how refunds are awarded in terms of cash, credit or product exchanges. Include this information in an obvious and easy-to-find location so shoppers never need to hunt for it. Most returns policies range from as short as 14 days up to 30, 60 or 90 days. Admittedly, it doesn’t seem fair to let consumers use products for much longer than that and still return their purchase free of charge. But the latest trend, spearheaded by Zappos and Coastal.com, is to offer a 365-day returns policy. According to Zappos’ head of customer loyalty, Rob Siefker, the longer the return period, the more comfortable shoppers are about making their purchase in the first place, which in turn increases your overall conversion rate. In fact, when clothing and accessories retailer 3rd Power Outlet increased their returns policy from 14 to 90 days, the total number of returns actually decreased. If consumers have more time to decide whether or not to return a product, they feel less pressure about it and are more likely to become comfortable with something even if it didn’t fully meet their expectations. 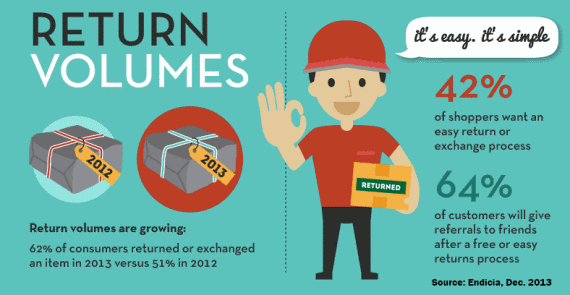 Returns are a hassle. Not only have you lost a sale but you also now have the added logistics and paperwork of managing your refunds, costing you time and money. Rather than staffing a returns department, businesses should try to automate as much of the returns process as possible. Automation benefits both you and your customers. By having a returns/exchanges form they can fill out online, you save the customer the hassle of calling in and save yourself from staffing someone to answer the phones. You can also simplify the whole process by shipping out pre-printed return labels along with every purchase so that the customer has nothing to worry about. At the end of the day, you still want to keep your return rate low. The best way to do this is to be as accurate and informative in your product descriptions as possible. Include everything you can, such as the product’s dimensions, colour, weight, material, and whether there are any additional elements required such as batteries or specific maintenance requirements. And of course, include several detailed photos. Finally, your returns policy contributes significantly to your customer’s overall experience. Even if you followed each of these tips to the tee, you’ll never know how solid your returns policy is until you ask your customers. If they are not impressed enough to come back for more, ask them why and adapt your policy to meet their expectations. After having a positive returns experience, 95% of shoppers will revisit an online store to make another purchase and 45% of them will actually recommend you to their friends, according to Endicia. So when it comes to managing your shipping and fulfillment, don’t forget about this all-important step of developing a solid returns policy. Subscribe to the DalPay Blog to be notified about all our future how-tos and industry insights that will help you to master the world of online retail, and follow us on Facebook and Twitter for the latest news from around the e-commerce industry.